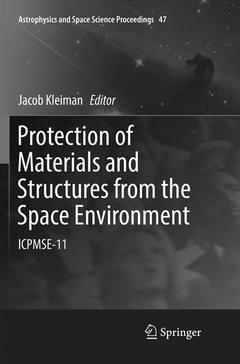 The proceedings published in this book document and foster the goals of the 11th International Space Conference on “Protection of Materials and Structures from Space Environment” ICPMSE-11 to facilitate exchanges between members of the various engineering and science disciplines involved in the development of space materials. Contributions cover aspects of interaction with space environment of LEO, GEO, Deep Space, Planetary environments, ground-based qualification and in-flight experiments, as well as lessons learned from operational vehicles that are closely interrelated to disciplines of atmospheric sciences, solar-terrestrial interactions and space life sciences. Foreword.- Preface.- Introduction.- Individual Contributions.- Index.- Bibliography. Dr. Jacob Kleiman is the leader of the ITL staff and an internationally recognized scientist and Adjunct Professor at the University of Toronto.